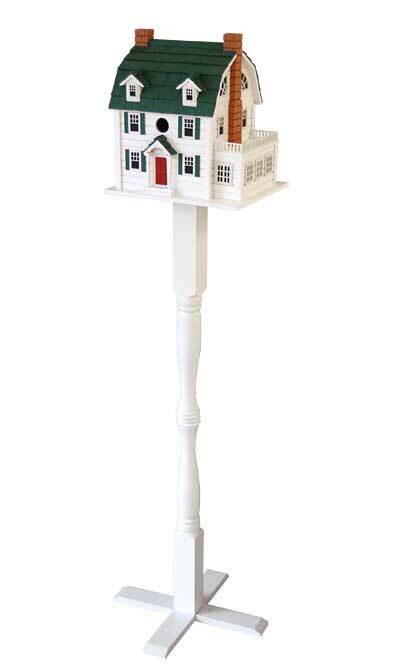 Showcase a familiar shelter in your backyard elegantly using this Home Bazaar Dutch Colonial Bird House with Pedestal. The gambrel roof, distinctive faux windows, and dual dormers on this home create a classic roost, while its white body with green accents enhances your landscaping. Faux chimneys flank the home to further the effect, and their orange color contrasts the white siding and green roof. The generous abode provides plenty of room for an avian family, and its bevy of window shapes lends it a spacious look. A 1.25" diameter opening rests above the red door, for birds to easily access the home, and the gambrel roof overhangs this entry slightly to protect it from rain. Two drainage holes on the base of the roost help any captured water escape, and a back panel removes for nest checks and maintenance. Place the wide, rectangular base of the home onto the included Home Bazaar Novelty Pedestal with Ground Auger, bringing extra elegance and style to the yard. Alternating round and square sections on this stand evoke a traditional newel post, and the hexagonal top plate holds the shelter easily. Dual, 16" long cross bars keep the post and house combination stable, while the 11.75" long, steel auger keeps the assembly secure in soil. The white finish on the post matches that of the home, and the wooden construction of each lends your yard a timeless look. Offer your feathered friends a hauntingly beautiful roosting spot with this Dutch Colonial Bird House with Pedestal. Note: Climate and the elements will weather these items and change their appearance over time; however, weathering will add to their natural charm without compromising their function. Should you want to preserve the finish (paint) of these units, you should cover them with several layers of a polyurethane product that is recommended for marine use (UV Rated) that will not turn the white paint yellow. You should expect that once left outside, the items will weather and require refinishing.